In the most recent batch of picture books from the library, the one I like best is Hena Khan's Night of the Moon: A Muslim Holiday Story (Chronicle, 2008), beautifully iluustrated by Julie Paschkis with lots of blue, green, and gold. I especially like how Yasmeen's Eid present at the end ties in with the overall storyline of her gazing at the moon. We have a bit of snow right now. Last week, there was a lot of wind. 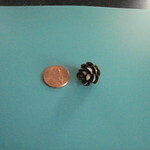 It flung penny-sized pinecones from a neighbor's tree into my driveway and front yard. They are adorable (but I have in turn been flinging them into the compost pile). I wanted some short comfort reads last week, so I brought home a stack of picture books. I ended up discussing a couple of passages from Tomie dePaola's Christmas Remembered with an Italian American friend ("have you ever eaten scungilli?"). Of the rest of the books, the two I enjoyed most were Karen Hesse's Come On, Rain! (1999) and Kathryn Lasky's Georgia Rises: A Day in the Life of Georgia O'Keeffe (2009), respectively illustrated by Jon J. Muth and Ora Eitan. Come On, Rain! -- Muth's watercolors are terrific, and what's more, the book features a diverse cast without making a big deal of it: Tessie, the narrator, is African American; Jackie-Joyce is maybe black or Latina; Rosemary is white, and Liz is Asian. Also, city! Georgia Rises -- Eitan's style is interesting. Her choices of when to be precise (as in her spot illlustration of Georgia tugging on a stocking) and when to leave things rough-edged or blurry (as in many of the main paintings) could occupy me for days. (That's not an adequate description, actually -- it's clear that when Eitan decided to let the paper or lower layers of paint show through the upper layers, that was every bit as deliberate as the placement of a crescent moon or the half-circles delineating a dog bowl.) I liked that the illustrator was not attempting to ape O'Keeffe, and -- this is unusual for me -- that the paintings had a folky, somewhat primitive feel to them. Kind of 2.5-D - not quite flat, but not full-bore perspective. Speaking of artistic choices, Jessi Graustein (whose press, Folded Word, has published some of my micropieces from time to time, has been posting some photos of her calligraphy practice/work on her Flickr photostream now and then. The glimpses of her playing with an Icelandic greeting are nifty.